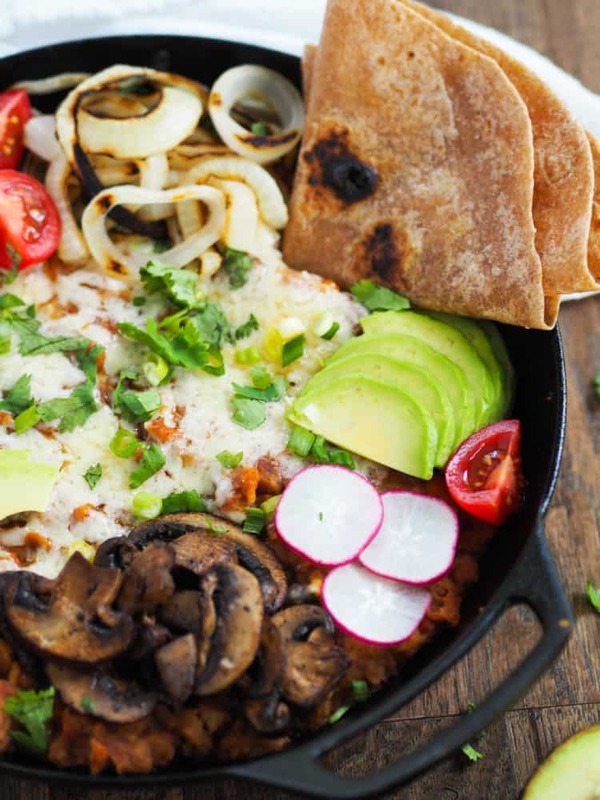 A deliciously cheesy and veggie fully loaded refried bean skillet! Weeknight dinners just got way more fun. Hey friends! I’m super excited to have my dear RD friend Rachael back on the blog today. 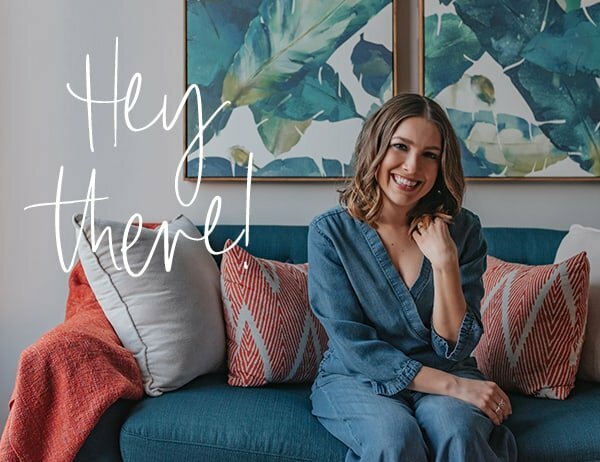 You may remember her from her Avocado A Day days but today she’s killin it over at The Joy of Eating, with a GORGEOUS new site and authentic style to what she preaches. I saw Rachael post a teaser for this recipe on Insta a week or so ago and was like oh my drool, I need this recipe stat. And so I was so pumped when this recipe landed in my inbox to share with you all! It’s like she was reading my mind :). Hi y’all! 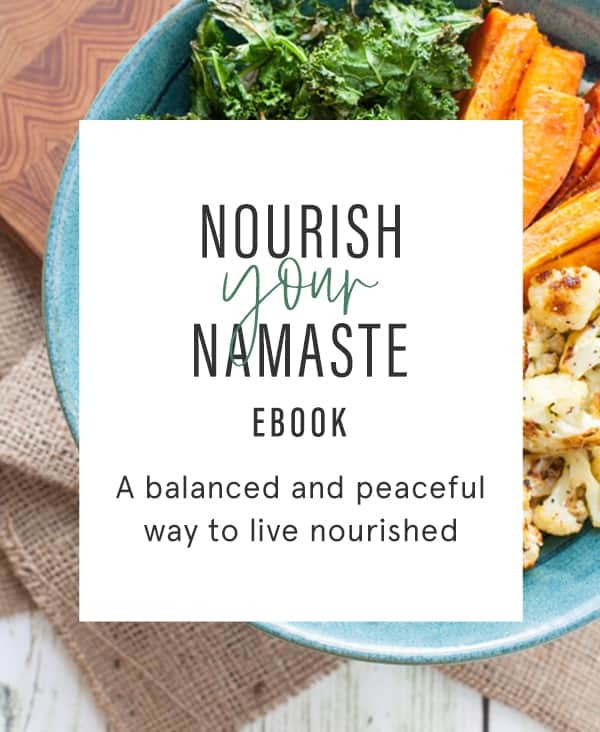 Kara’s one of my dearest dietitian friends and all around favorite human beings, so I’m thrilled to be guest posting on her blog while she’s doing her world traveler thing! 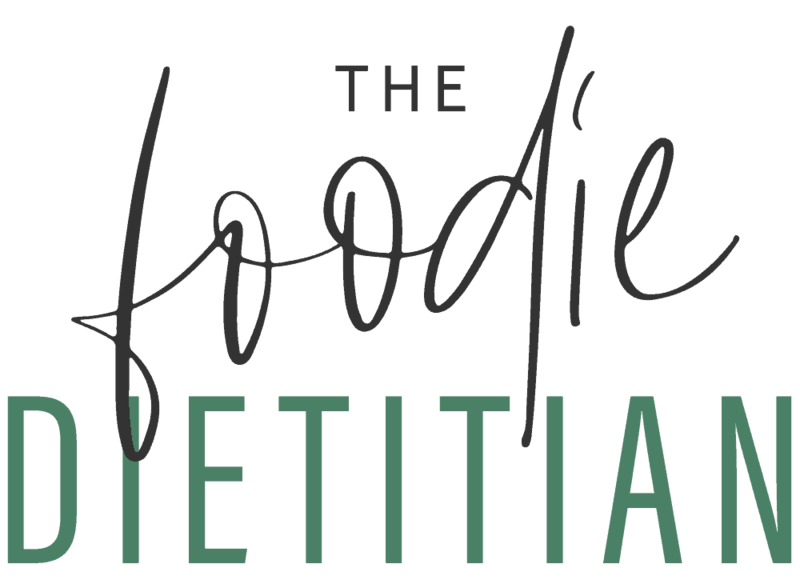 I’m Rachael, a private practice dietitian and blogger at The Joy of Eating, or as I’ve been calling it since my rebrand, The Artist Formerly Known as Avocado A Day Nutrition. Like Kara, I’m passionate about helping people nourish a healthier relationship with food and their body. 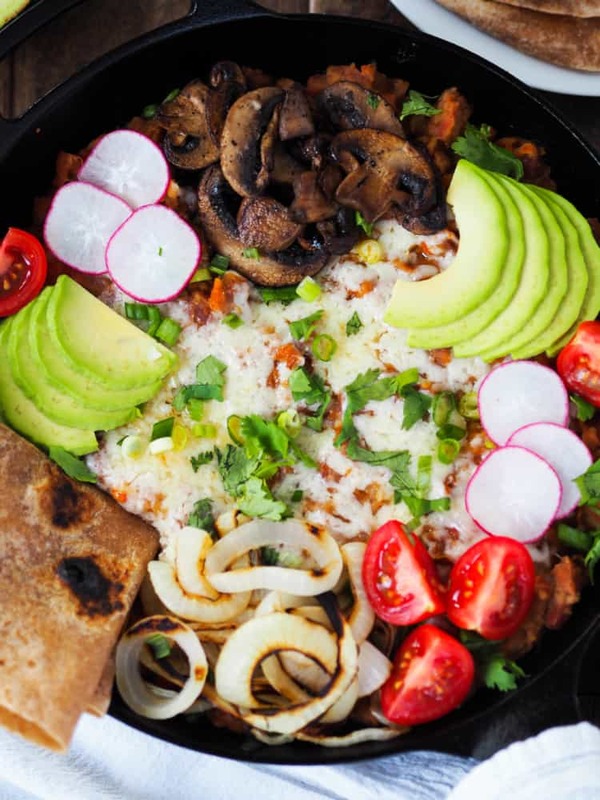 This recipe for fully loaded refried bean skillet was inspired by a massive craving for cheesy Mexican food I had a couple weeks ago. I had a pretty icky day, and while part of me felt like I “should” go out for a run to burn off some anxiety, what I really wanted was Mexican food and a glass (or two) of wine. As you can see, I went with the latter. Emotional eating gets a bad rep, but I like to look at it as just one option in a whole toolbox full of self care. Sometimes I like to journal. Other times I like to veg out on the coach with ice cream and a nerdy documentary. Sometimes I take a yoga class. Other times I get pizza and beer with friends. Emotional eating isn’t “bad” persay, it’s when you become overly reliant on emotional eating and don’t deal with the underlying emotions. I tell my clients that instead of feeling guilty for emotional eating, to try and make a conscious choice to emotionally eat after examining other options for self care. 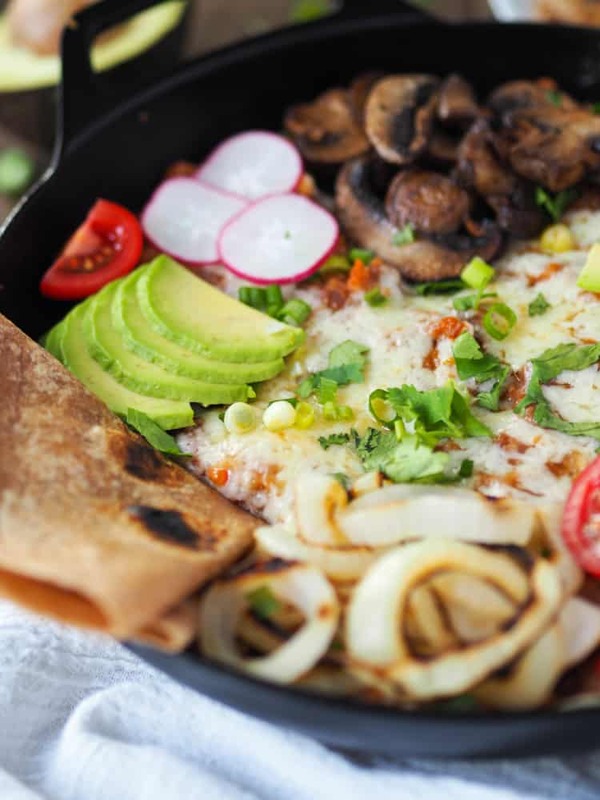 This refried bean skillet is comfort food to the max – plenty of carbs, melty cheese, and lotsa spice. Save time by swapping two cans of refried beans. You could stir in the tomatoes and chilies to add texture if you like. I like to use an extra-sharp cheddar for extra flavor. If your avocado isn’t ripe, just use a scoop of guacamole. 4 whole wheat tortillas, warmed over a gas flame or in the microwave for a few seconds. First, while you’re prepping the vegetables, grill the onion rings and mushrooms. Oil the grates of a grill. Heat on medium-high, and grill onion rings for 4-5 minutes per side until tender and grill-marked. Grill mushrooms about 5-6 minutes total until tender and grill marked. Season with salt. When mushrooms are cook enough to handle, slice. Set aside until ready to use. Next, make the beans. Heat oil in a large oven-proof skillet on medium-high heat. Add the onion and garlic and sauté until onion is tender, about 6 minutes. Stir in chili and cumin and cook a minute. Stir in tomatoes and chilies and cook until most of the liquid is evaporated. Season with salt and black pepper. Pour beans and beer into the skillet and cook a few minutes to bring to a simmer. Mash using a potato masher until the beans are mostly pureed. Add more bean liquid if needed to get to desired consistency. Heat broiler. Top beans with cheese and place under the broiler about 1 minute to melt. 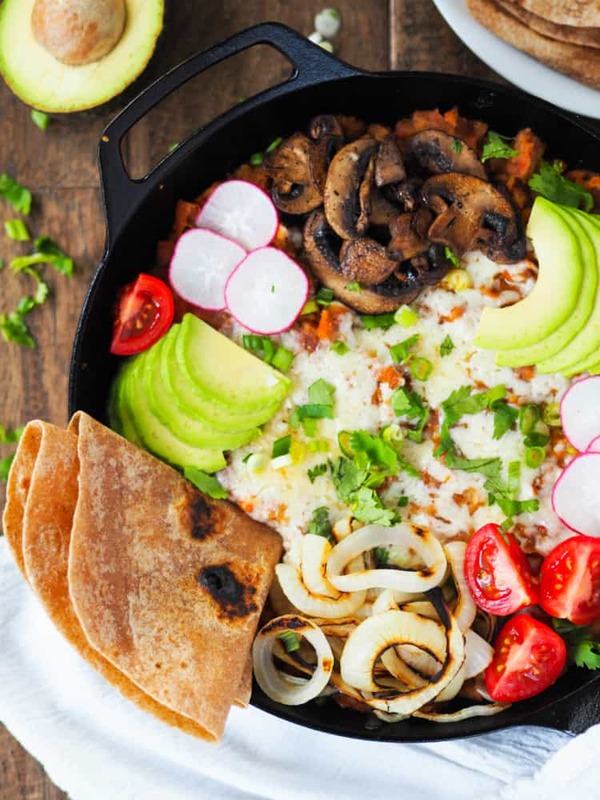 Serve skillet topped with grilled onion, tomatoes, and avocado. Garnish with cilantro and green onion. Serve with tortillas for dipping. 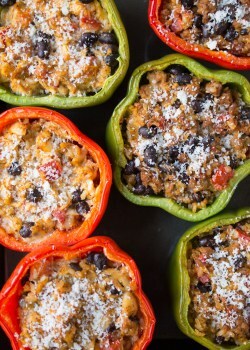 Big thanks, Rachael for sharing this awesome recipe on TFD! I hope ya’ll enjoy! For more Mexican food inspiration, check out my recipes below! you just solved my “what’s for dinner tonight?” question that’s been looming since this morning since we were away this weekend and I had no time to plan. I think I even have most of these ingredients in my fridge/pantry so I can get something pretty close and not even have to go to the store! Yesss! Love solving that question for people! I cannot stand the consistency of beans or peas. Hate the taste as well. Always have BUT I really like refried beans (buy cans and doctor them up). 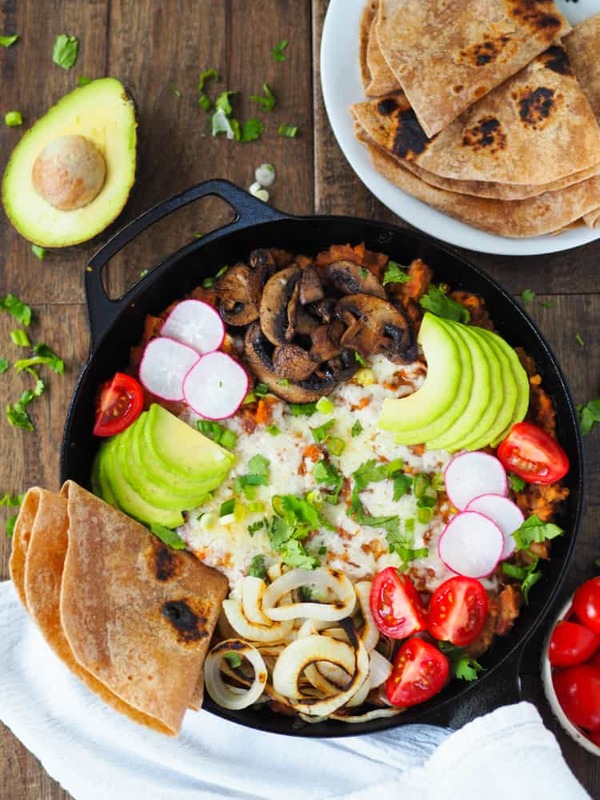 I love the idea of making my own refried beans but Can I first mash the beans completely in a vitamix or other such equipment before adding them to the pan? Hey Marie – I don’t see why note! Go for it! Wow looks great! So colourful! Yes! Big thanks to Rachael for sharing! 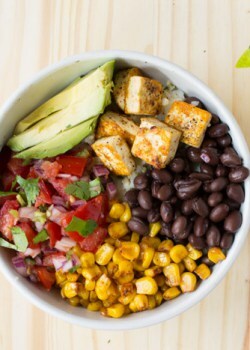 This does look fully loaded with goodness and great taste! Yes! Also, can every day be Taco Tuesday?? I can’t get over how delicious this looks- all the colors and textures! I definitely want to try this! I know, right?! 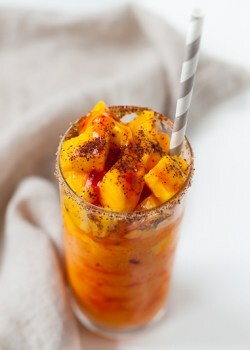 Rachael continuously blows my mind with her recipes and photography! Wow! Fully loaded is right! This is gorgeous. And thanks for your helpful perspective on emotional eating. Glad it was helpful, Pamela. Agreed, Rachael made a gorgeous dish! All those flavors – fully loaded indeed. This looks so good! Agreed! Rachael is making me seriously hungry. I totally agree with you!! Homemade is always better than anything out of a can!